WASHINGTON – The United States Mint (Mint) is pleased to announce a new family of youth products in 2019 – the Mint’s first new youth products in five years. There will be three new products for kids in 2019, featuring the Mighty Minters™ — Kendra, Timothy, Sophie, Lina, Alex, Eli and Layla. They are fun, approachable, and wholesome coin collecting ambassadors to children and gift givers intended to pique the interest of kids seven to 12 years of age. 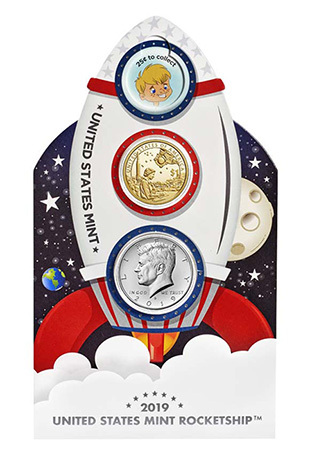 The first product offered in this series is the United States Mint Rocketship™. This product is expected to go on sale in February 2019, with detailed information to be released later in the month. Look for this set in Spring of 2019. It features Mighty Minters Alex, Eli, Sophie, and Timothy, and contains the following proof finish 2019-dated coins: one Native American $1 Coin, one Kennedy Half Dollar, and one America the Beautiful Quarters® Program coin. The set also contains one dime, one nickel, and one penny, all in uncirculated finish and capable of being removed. A penny planchet is also included. There are four openings for the remaining 2019 quarters, which kids can fill as they find the quarters in their change. This interactive set comes with an activity booklet with games, and links to United States Mint videos. This set contains one each of the five 2019 America the Beautiful Quarters® Program Coins in proof finish and one $2 bill from the Bureau of Engraving and Printing. Mighty Minters Timothy, Alex, and Eli adorn the colorful folder. The target release date for this set is late October 2019. As we introduce each product, we will also introduce you to the Mighty Minters™.